PROSPECT — Region 16 Public Schools recently announced its policy for determining eligibility for free or reduced-price meals under the national school lunch and school breakfast programs. 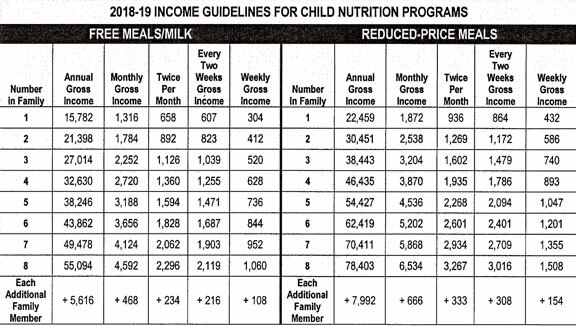 The income guidelines (pictured in the graph above) will be used in Connecticut from July 1, 2018 to June 30, 2019 for determining eligibility. Children from families whose income is at or below the levels shown are eligible for free or reduced price meals. Application forms were sent to homes with a letter to parents. They can be filled out and returned to schools. Additional copies are available at the principal’s office at each school and online at region16ct.org. No application is required if the district directly certifies a child based on a household member receiving assistance from the Supplemental Nutrition Assistance Program or Temporary Family Assistance program. All children in such households are eligible for free meals. Foster children that are under the legal responsibility of a foster care agency or court are eligible for free meals, even if the foster family is not eligible for the benefits. Applications will be reviewed to determine eligibility. Parents can request a formal appeal of a decision in writing to Superintendent of Schools, 30 Coer Road, Prospect, CT 06712, or by calling 203-758-6671. If a household member becomes unemployed or if household size changes at any time, the family should contact their school to file a new application. For more information, call 203-758-6671.